Mary Ellen McGuire held the position of Assistant to the Deputy Chief of Staff to the First Lady and Assistant Director of Research from 1998 to 2000. She was one of the First Lady’s primary researchers working on speeches, issues analyses, event briefings and briefing books. She was the liaison with the White House Millennium Council and helped coordinate the White House Conference on Philanthropy held in October 1999. This collection consists of records related to children’s issues, including adoption, children’s health, child care, and international child abduction. 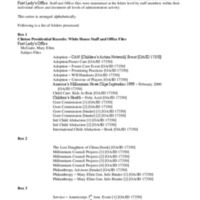 The records also contain material on projects of the White House Millennium Council, Americorps, and the White House Conference on Philanthropy. The collection consists of memorandums, faxes, letters, event invitee lists, reports, publications, news clips, and printed e-mail.